But, at the start of the campaign, most people who opposed the reforms were saying they wouldn’t vote. So, until the last few weeks, the “Sí” camp had a majority among likely voters. So what we’re facing is a remarkably fluid race: one that will come down to turnout. 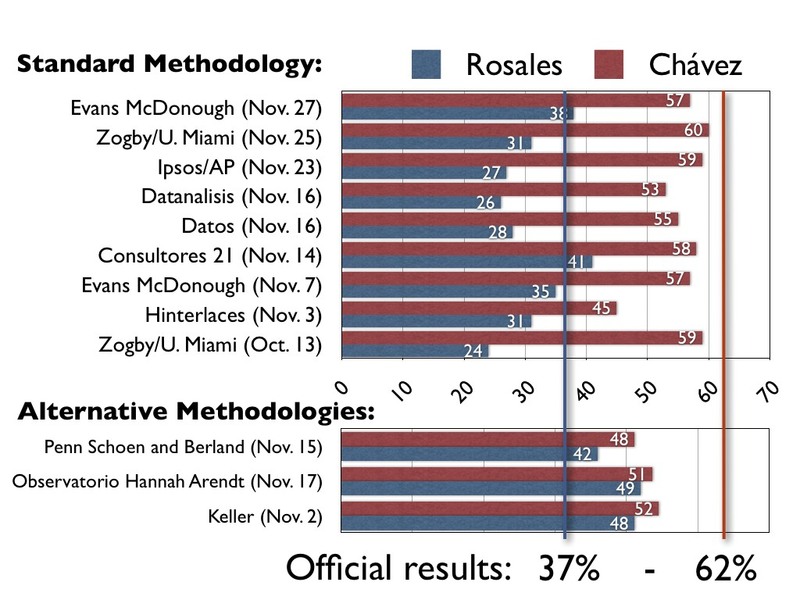 Causes for caution: as you can see, many of these polls were carried out in urban areas only, and a couple of them just in the Caracas Metro area. The opposition always does relatively better in urban than in rural settings. Over a fifth of Venezuelans live in towns and villages of less than 20,000 people: they almost never get polled, and they trend heavily in favor of the government. Moreover, identifying “likely voters” is a notoriously haphazard game: more art than science. Venezuelan pollsters usually rely on people’s self-reported willingness to vote, which is an iffy proxy at best. The magnitudes here are not significant, since it’s a Caracas-only poll. But the trend is significant, and very striking. Finally, those of you minded to dismiss “opposition pollsters” due to bias are urged to check out how they did ahead of last year’s presidential election.